If you are an out of network provider submitting claims on a client's behalf this article will show you how to configure the client's account properly. Go to Client > Details > Bill to and Insurance Info. Click "Add Primary Insurance"
From here you can enter the client's policy information as you would with an in network client. 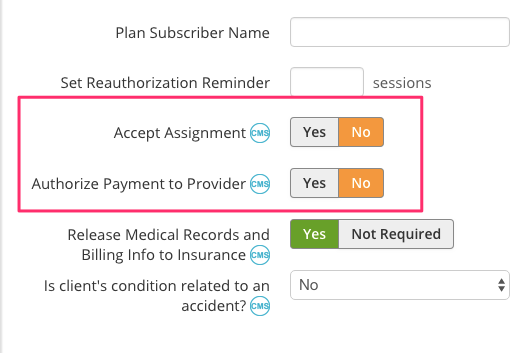 For "Accept Assignment" and "Authorize Payment to Provider" select "No"
"Accepting Assignment" indicates that you are accepting the insurance companies contract rates as payment in full. If you are contracted with an insurance company you must select "Yes." When you are out of network you have the choice the accept or not accept assignment. "Authorize Payment to Provider" indicates where the payment should be sent. Choosing "Yes" means that the payment should go directly to you. If the client has already paid you in full and you are submitting to their insurance as a courtesy you will select "No" so the client is reimbursed directly. Note: If you are submitting to an out of network insurance for the first time, they may require you mail or fax a W-9 before they will process the claim. Be sure to check with the payer on their requirements before submitting claims to avoid a delay in payment. If the client's invoice has already been marked as "Fully Paid" in TheraNest you can follow this tutorial to submit the claim.